Earn 209 loyalty points when you order this item. This is an expertly matched turntable upgrade package consisting of the Nagaoka MP-110 MM phono cartridge and Edwards Audio Apprentice MkII phono stage. 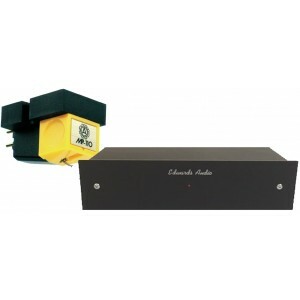 Edwards Audio Apprentice Equaliser (EQ) phono stage is the MkII version of the hugely popular Edwards Audio MM1 and uses a similar circuit topology with passive treble and active bass equalisation as well as a second stage amplifier to buffer the equalisation network and ensure a low output impedance which is very rare in this price bracket. MP-110 features a superfine polished elliptical diamond bonded stylus as well as a powerful samarium cobalt magnet for drawing out the finest musical details and nuances. A lightweight aluminium alloy cantilever equals extremely high fidelity - the MP-110 offers detail recovery and precision that few others at this price point can. For more information on the phono stage, please visit our main Apprentice MkII page. For more information on the cartridge, please visit our main Nagaoka MP-110 MM page.